Suffolk house hunters have been warned to move fast or miss out, as a popular Exning development nears completion. 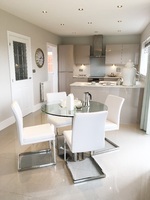 Premium housebuilder Charles Church has just six properties left at its Chancery Park location at Burwell Road. Michelle Baker, sales director for Charles Church Suffolk, said: “Exning is such a sought-after village so it came as no surprise to us that the development proved very popular with local buyers and people keen to move into the area. New homes at Chancery Park start at £330,995 for a three bedroom detached house including a comfortable living room, an open plan dining kitchen/family room, downstairs cloakroom and en suite to master bedroom. Michelle added: “We have a number of packages to assist people looking to move, including the Government’s Help to Buy scheme which enables people to purchase a new home with just a five per cent deposit.